so what do you give yourself permission for today? I gave myself permission to play in my crafts room today. Completed a LO and finished a canvas that I started months ago. The birds are certainly something! Hope you had a great day, Nat! Enjoy every mminute of your “nothing” moments! Beautiful colors and love the humor in the message! Are the birds cut out and collages or is it a stencil? 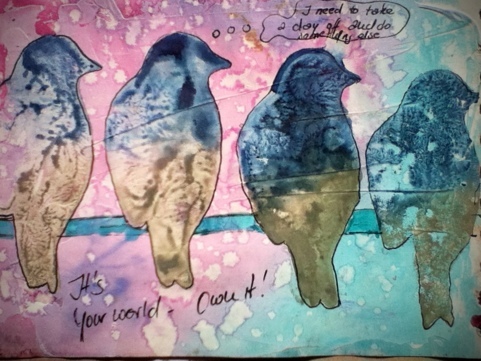 I love the birds – if you (and I ) don’t play then art is only work! Nothing will kill the creative spirit quicker than that.